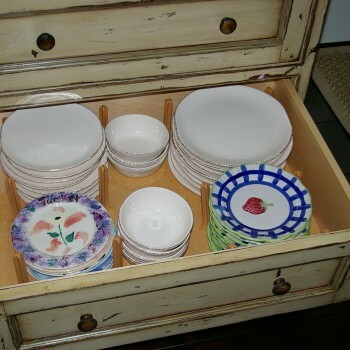 We offer a large selection of wood option for your drawers. If you don't see one on the list, feel free to reach out to us and we'll make it happen. 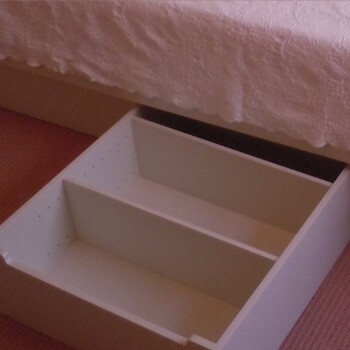 DrawersOnline offers a huge selection of options for your drawers. If you don't see an option you need, contact us directly through the contact/support form or email/call us directly. Cut-out 4.25 x 2.375 AM Co.
Cut-out 4.25 x 2.625- AM Co.
Outside edge only, sides and back. Inside, sides and the back outside of the drawer. 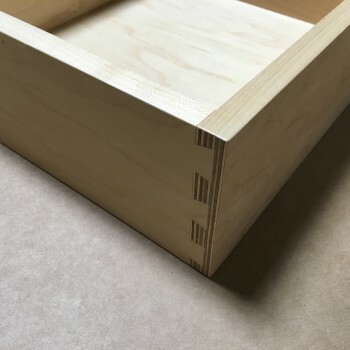 Angled sides of the drawer. 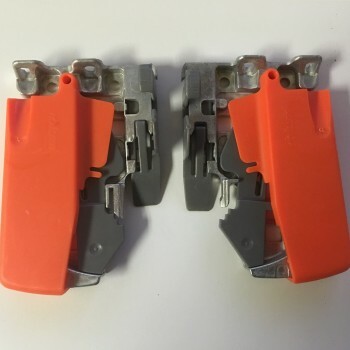 TANDEM plus adjustable depth locking device set for inset drawers. 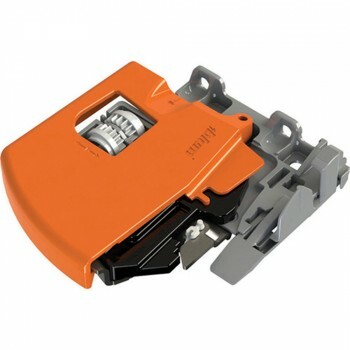 Blum Locking Device for use with 563/569 series runners, height and side to side adjustments. 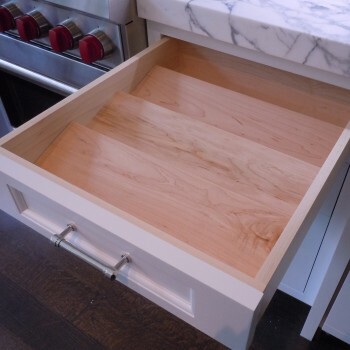 A corner drawer with a minimum of 15" depth and 10" width. 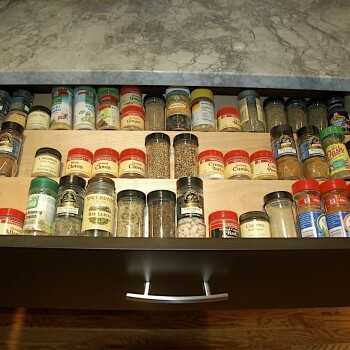 A curved concave drawer. Drawer must have a 10" width minimum. Specify radius in order description. 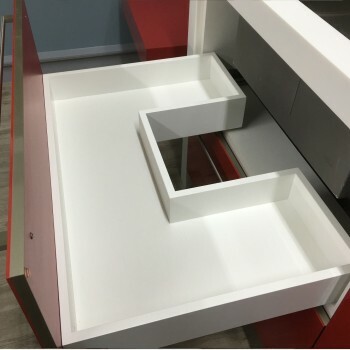 A curved convex drawer. 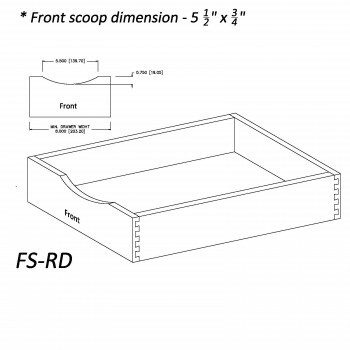 Drawer must have a 10" width minimum. 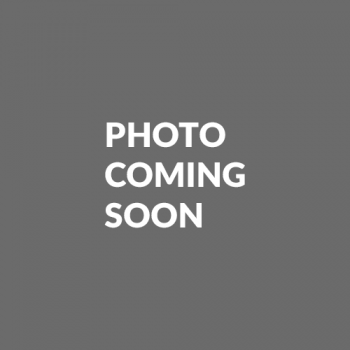 Specify radius in order description. A special cut out in the drawer. Please specify in the order description, or contact us directly. A custom finish on the drawer. Please specify in the order description, or contact us directly. Please specify in the order description, or contact us directly. 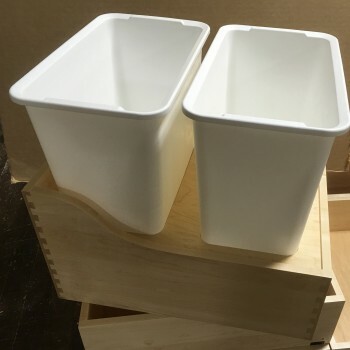 Removable and adjustable center horizontal 1/2" thick wood divider from side to side. Removable and adjustable center 1/2" thick wood divider front to back. Center horizontal and center vertical 1/2" thick wood dividers. Two adjustable and removable vertical dividers from front to back. Cutlery dividers, adjustable and removable, two horizontal 4" space between, three vertical 1/2" thick wood dividers. 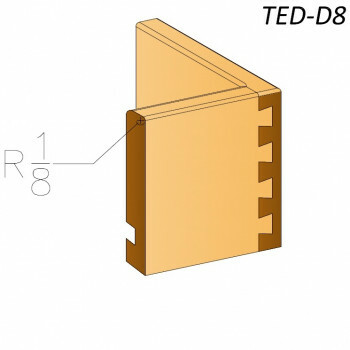 Please specify in the order description horizontal dividers location (front or back). 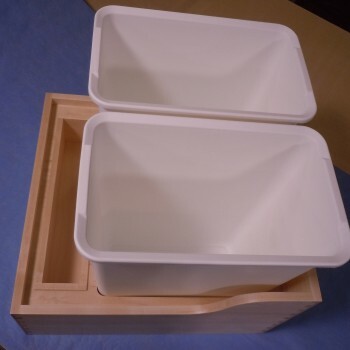 Cutlery dividers, adjustable and removable with one horizontal 4" from drawer front and three vertical 1/2" thick wood dividers front to back. 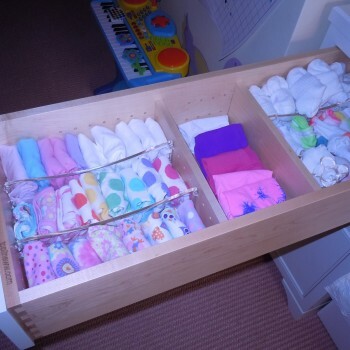 1/8" x 1/2" slots on the sides of the drawers with bars. File bars running side to side. 1/8" x 1/2" slots on the front and back of drawer with bars. File bars running front to back. 1/8" x 1/2" slots on the front and back of drawer with bars. 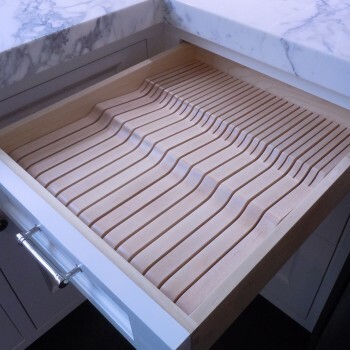 In drawer knife tray custom fit to the drawer. Pegboard drawer with eight pegs. A front round scoop. 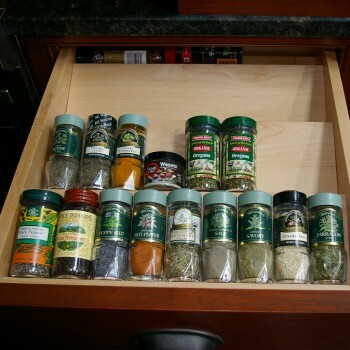 The minimum a drawer width with is 8". A trash pull out. West Containers not included, they must be ordered separatly. 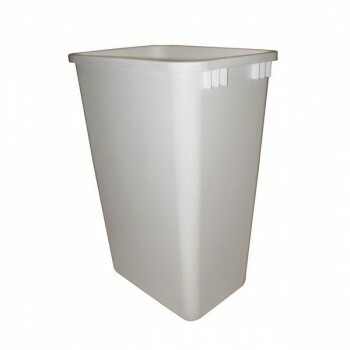 Trash pull out with storage. West Containers not included, they must be ordered separatly. Drawer inside the drawer. Full extension side mounted slides included. 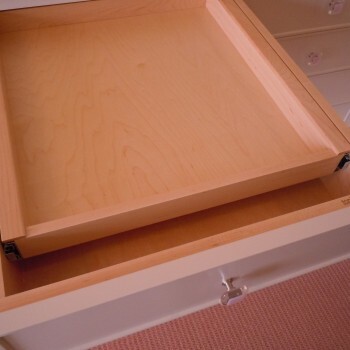 A U-shaped drawer. 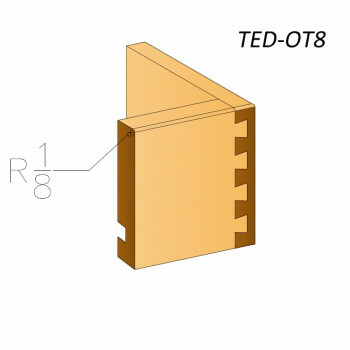 Please specify all dimensions in the order description, or contact us directly. Have any questions on our catalog?